A peptide corresponding to 11 amino acids near the amino-terminus of human DEDD2. Our Abpromise guarantee covers the use of ab36858 in the following tested applications. WB Use a concentration of 0.5 - 2 µg/ml. Detects a band of approximately 26 kDa (predicted molecular weight: 36 kDa). Apoptotic signals are often triggered by cell surface death receptors through protein-protein interactions mediated by conserved domains such as the death effector domain. A novel death effector domain (DED)-containing protein, DEDD2, has been recently identified. Over-expression of DEDD2 in transfected cells induces moderate apoptosis and results in substantial sensitization to apoptosis induced by Fas, TRAIL, and FADD. More recently, it has been shown that DEDD2 can bind caspase-8 and -10 in addition to FLIP but not FADD. Like the related protein DEDD, DEDD2 translocates from the cytosol to the nucleus upon induction of apoptosis, and it has been suggested that DEDD2 may target caspase-8 to the nucleus and that DEDD2 thus plays a critical role in death receptor-induced apoptosis. At least two alternatively spliced transcript variants encoding distinct isoforms have been found for DEDD2. Nuclear, accumulated in subnuclear structures resembling nucleoli. Lanes read from left to right 1, 2 and 3.
ab36858 has not yet been referenced specifically in any publications. Publishing research using ab36858? Please let us know so that we can cite the reference in this datasheet. We appreciate your effort in following this up for us, a refund would be our preferred option. Please let me know if you need any more information from me to complete this transaction. Please find attached questionnaire as requested. - try the antibody 5-10ug/ml. - In our lab we use 5% BSA as blocking agent. Please try this. - We in lab heat lysates for 10 minutes at 100C. Please try this step. I am sure these suggestions will help to get nice clean band of correct size. Please do not hesitate to contact me for further assistance if the results does not improve. 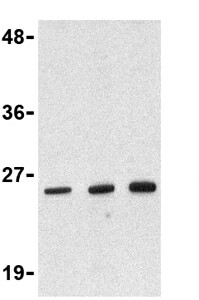 “We have recently purchased the antibody DEDD2 (ab36858) and have tried to detect the protein by western using the recommendations on the supplied spec sheet. Unfortunately an overnight incubation at final antibody concentration at 2ug/ml did not produce the expected result (26-36kDa band). However, after a lengthy 10min exposure a 70kDa band was observed. We are concerned this may be an alternative isoform (DEDD1). Could you please provide technical assistance for this product on how we can achieve the expected band. We loaded 25ug total protein per well." I have attached a Technical Questioner completed by customer as well. This was purchased by Sapphire on our PO# PO-14403, dated 07/06/12. PS. I tried to lodge the inquiry online but it wouldn`t let me as it kept asking for the correct lot#. Please see screen shot below. Could you please attach the questionnaire, I am sorry we haven't received it.